This was our third straw bale gardening demonstration using the books Straw Bale Gardens and Straw Bale Gardens Complete (Joel Karsten, 2013 and 2015, Cool Springs Press) as references. With our previous successes in 2013 and 2014, and with so much interest from home gardeners, we decided to try it once more, this time during an extreme drought. From our previous experiments, we knew that the straw bales maintain moisture that is necessary for good plant growth. So how did they do this year with limited water and extreme heat? Read on. In straw bale gardening, the bales are the container (a type of raised bed) as well as the growing media. As the straw inside the bale decomposes, it provides nutrients for the plants. The straw will continue to decompose and the bales will collapse over the winter, and then will be used as mulch in our raised beds next year. We started out by “conditioning” the wheat straw bales (we used rice straw in 2014), the process of getting the bales to compost internally so root growth can be supported. Using a very precise 3-week fertilization and watering schedule as set out in both books, blood meal, fish meal, bone meal, and kelp meal, (all organic fertilizers) were applied and watered in. We chose to use organic fertilizers, but a high nitrogen lawn fertilizer could be used as well for a little faster and less expensive, non-organic conditioning process. As we experienced in the two previous experiments, the use of blood meal was very unpleasant. Combine that with fish meal, and the odor was quite smelly. In 2013 and 2014 we used feather meal with the blood meal, and the odor was bad enough. This year was epic in the "stinky" department, and the smell attracted legions of flies. The bales had to be covered with chicken wire to keep critters from digging in the straw. When using those organic nitrogen fertilizers, we definitely do not recommend placing the bales near your back door or any other place where the odor could be a problem. However, once the conditioning process was over, the odor diminished considerably. The temperature of the interior of the bales was taken each day during the conditioning process, and we noticed that it did not heat up as much as in previous years (a peak temperature of only 110ºF); however, it did heat up enough to activate bacteria inside the bales to start the decomposition of the straw. At the end of the conditioning process, mushrooms appeared on the surface of the straw, a sign that the inside of the bale had decomposed nicely. We noticed that the mushrooms were much more prolific than in previous years, and they persisted in a dried state throughout the growing season, giving off a somewhat "toasty" aroma. While the presence of mushrooms was a good sign, there is the possibility that when they push up through the straw, they could dislodge seeds that are planted in the bales. We did not experience this because we used well-established transplants that were not disturbed by the emerging mushrooms. On May 16, 2015, during a straw bale gardening demonstration at an Open Garden, we planted in the straw three plants each of 'Kajari' melon and 'Honey Nut' baby butternut squash, all from 4-inch pots. 'Kajari' is a rare melon from India, and 'Honey Nut' is a personal size squash. A cattle panel trellis was installed and the melons and squash were trained on it. Because the melons slip from the vines when mature, they needed support as they grew, so we supported the fruit with slings made from strips of old t-shirts. The squash did not need to be supported with slings because their stems are thick and sturdy and need to be cut from the vines when mature. The same irrigation method (shrubblers attached to ½-inch supply line) and fertilization schedule (monthly fish emulsion) that were used in 2013 and 2014 were again used in 2015 (see 2013 straw bale gardening demonstration article for irrigation and fertilization information). It is critical that the strings that bind the bales be kept taut at all times. If the strings loosen as the straw decomposes, compression will be lost and the interior of the bales can dry out. Keeping the bales tightly bound was one of our biggest challenges in 2013 and 2014; however, we did not experience collapsing bales this year. Our assumption is that wheat straw does not decompose and break down as quickly as rice straw (which we used in 2014). Another factor could be that the wheat straw was baled differently than the rice straw. In 2013 we cut the loose strings and retied them several times to keep them taut. In 2014 we cut the strings and attached turnbuckles so they could be periodically tightened. We did not find that either of those methods worked very well, so this year we encircled both bales with ratchet tie down straps (right). This method worked the best, allowing us to easily tighten the straps to keep the bales compressed. We also used a tourniquet technique to keep the individual strings around the bales tightened. This involved inserting a short stick behind each string and twisting the stick in one direction until the string is tight; then securing the stick. We had problems in previous years keeping the bales upright. As the straw decomposed, the bales tended to lean to one side, so we used boards and stakes in an attempt to keep them upright. This year, as a preventative measure, we inserted short bamboo stakes between the straw and the ratchet tie down straps (right). To our surprise, both bales held together very well with minimal collapsing. Because the bales were in such good shape at the end of the summer growing season, we decided to plant cool-season crops in the bales after the melons and squash were removed. The melon and squash plants grew prolifically and produced a large number of fruits. Seven weeks after being planted, the cattle panel was completely covered by healthy vines. They suffered no ill effects during the several weeks of triple-digit temperatures and set a considerable amount of fruit. We harvested our first ripe melon on July 15, 2015, (60 days from transplanting) and had an informal tasting among the Master Gardeners who work in the vegetable demonstration garden. The melon turned from a dark green with light stripes (left below) to a beautiful orange (middle below) and it slipped from the vine when it was ripe in the same manner as a muskmelon/cantaloupe. The soft green flesh (below right) was reminiscent of a honeydew melon in flavor but was a bit more complex (some tasters noted a bit of saltiness). By the end of the growing season, we harvested 11 'Kajari' melons and 26 'Honey Nut' baby butternut squash before the plants were removed on September 23, 2015. Conclusions: With the exception of the malodorous issue during the conditioning process, we have had nothing but positive impressions about growing in straw bales. 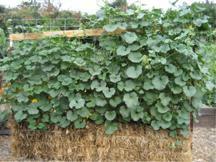 They can be placed almost anywhere, they retain moisture extremely well as long as they are kept under compression, the bales make a relatively inexpensive (albeit temporary) raised bed, the labor involved in maintaining the bales was minimal (no weeding), and the following season the decomposed straw can be used as mulch in the garden. We highly recommend growing vegetables in straw bales, especially if the soil in the garden has diseases, nematodes, weeds, or is contaminated in some way. Because we experienced wide-spread fusarium wilt on tomatoes in the raised vegetable beds at the FOHC, we plan to try growing several tomato varieties in straw bales next year.